Millions of German rail passengers were struggling to get from A to B on Wednesday after the German Railway Union (GDL) started a new mass strike following a failed round of pay negotiations with state railway operator Deutsche Bahn. Two in three long-distance trains were canceled thanks to the strike, and hundreds of commuter services were also halted. Large crowds in train stations and traffic jams on highways were the natural result. Deutsche Bahn warned passengers about the strike disruption on its website. The union’s leadership has not yet announced the strike end date. GDL is demanding a 5 percent pay raise, as well as a reduction in working hours from 39 to 37 per week. 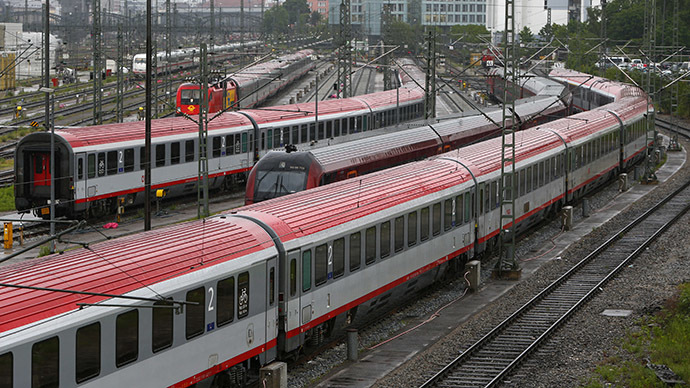 Deutsche Bahn has offered a 4.7 percent wage raise, but without any reduction in working hours. “For 10 years, there weren’t hardly any wage increases. And now the economy is booming like hell and people want a piece of the cake,” economist Michael Mross told RT. The ongoing strike, which started Wednesday evening, is the ninth in the past 10 months. “There has been so much strike action because people feel they have to defend themselves from frozen wages and demand better salaries and working conditions. Some people made millions from these companies so it’s time these profits were distributed fairly,” said Heike Hansel, an MP for the Left party. Chancellor Angela Merkel has called on the conflicting parties to enter mediation, as industry is estimating the possible damage from the walkout at up to 100 million euros ($110 million), according to Reuters. Already in 2015, twice as many working days have been lost to industrial action than in the whole of the previous year. “GDL is taking Deutsche Bahn customers hostage for egotistical reasons to get more power," said Ingo Kramer, president of Germany's BDA employers' association, dpa news agency reported. GDL has been criticized for its action, not only by businesses and government, but also by the Confederation of German Trade Unions (DGB). “I doubt that a man who still has not achieved his goal after eight strikes in a row is really interested in any other alternative than another strike,” said Reiner Hoffmann, the head of the DGB, referring to Klaus Weselsky, the head of the GDL, Tagesspiegel reported. The mood for a walkout is meanwhile not just limited to the German railway industry. Metal workers, kindergarten teachers, and employees of electronics giant Siemens have all taken strike action in the last five months.